The Byron Shire Mayor says the council has been grappling with the issue of illegal camping for decades. There’s renewed focus on the situation after police discovered a number of makeshift campsites in the Arakwal National Park during the search for two missing bothers. Simon Richardson said up to a hundred people sleep rough throughout the shire on any given night. “We get some groups who are pretty anti-social and camp in some really fragile environmental areas and do a fair bit of damage with tree removal for fires etcetera,” he said. Cr Richardson said problems with illegal camping are only going to get worse unless something is done. He said finding legal accommodation alternatives should be a priority. “Where at least they minimise the anti-social impacts on nearby residents, at least that’s a first step,” he said. “Of course what we’d love to be able to do is find actual accommodation for those who do seek it. The National Parks and Wildlife Service said people caught illegally camping risk being fined if they refuse to move on. Spokesman Lawrence Oral said two notices were recently issued to people found camping in the Arakwal National Park. He said there are good reasons why camping should be confined to designated areas. “One of the reasons why illegal camping is a concern is the fires that are associated with these often obviously pose a potential bushfire threat as well,” Mr Orel said. Behind Byron Bay’s stunning beaches is a thrilling artistic and cultural community. When thinking about the greater Byron Bay region, world-class beaches, sunshine and a laid-back lifestyle may spring to mind. Yet for Byron Bay Shire Mayor Simon Richardson, it’s the thriving artistic community that underpins much of the social and cultural fabric, and gives a unique sense of personality to the Shire, from Bangalow to Lennox Head, to Byron Bay itself. ‘A place without art is a very dull place indeed. We are lucky in Byron in that we have over two times the state average of those working in the creative industries. ‘We have a rich tradition of cultural creativity, and so for us in a way it ensures that the alternative or progression of culture and community here continues to have a voice, continues to share their skills and ideas with the wider community,’ he said. ‘The good thing about Byron is we have various streams of creative industries. Not only does it reflect who we are, they’re actually nationally or internationally renowned. We are really quite spoilt in this Shire. A short journey by plane from most major Australian east coast cities makes Byron Bay the perfect destination for artists and art enthusiasts alike. ‘That capacity to travel is a key statistic of the Byron sensibility,’ said Richardson. Working in Byron Bay are artists from all streams of the creative industries, from visual artists, sculptors, circus artists, theatre makers and filmmakers. ‘Not only do they reflect who we are and give locals an opportunity to experience creativity – they are nationally or internationally renowned,’ said Richardson. Indeed cross-collaboration can be seen in many more examples across the region. Splendour Arts, the arts program supporting the forthcoming Splendour in the Grass Festival, is just one of the many large-scale festival platforms operating in the region, alongside Falls Festival, the Byron Bay Writers Festival, Byron Bay Blues Fest, the Byron Bay Film Festival and the Boomerang Festival. ‘They [Splendour] spend some serious money and serious focus in planning installations and artistic interactions with the punters. In fact, a lot of our festivals do a similar thing – they grab the other threads of the creative industries and weave them in,’ said Richardson. Splendour Arts curator Craig Walsh agrees with Richardson that the opportunity to work with local artists has exposed him to a thriving eclectic group of artists who work together across a range of art forms. ‘It’s quite a competitive place to work because there are so many artists living in the area. ‘The networking assists with that. I still think it’s a lifestyle choice, which is very sympathetic to artists, which brings so many artists to the region. There’s definitely a sense of community that crosses over between art, music and the commercial,’ he said. Walsh adds that the Byron Arts and Industry Estate is of equal significance – home to many jewellery makers, glass sculptors and fashion designers. ‘I’ve seen that transform essentially from a typical industrial estate to becoming a residential, studio, industrial estate and I think that’s important for the continuation of the art community in Byron Bay. 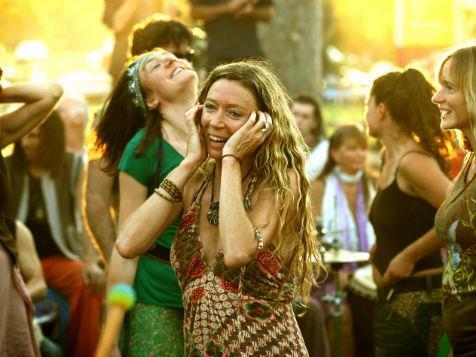 While local artists appeal to segments of the tourist market, Walsh said that Byron Bay has strong historical relevance as the birthplace of the modern music festival, as first seen within the illegal outdoor “doof” held on properties around the Byron region in the 1990s. ‘Something like Splendour in the Grass is really an evolution of that and I think that it’s something really distinctive that encapsulates Byron in music and art, as a sort of maverick approach to creating events,’ he said. Richardson said that this positive sense of community is also reflected through the effect of arts on the local arts economy. ‘Apart from tourism, it’s the biggest show in town. There are lots of opportunities for artists and arts workers interested in the festival environment; partially it’s really helping to sustain the arts community in that region. ‘Obviously festivals do a lot more than just put on music. There’s employment, there’s creative and there’s businesses in that region,’ he said. Visit the Legendary Byron website for more details about the Greater Byron Bay region. The northern rivers has the highest concentration of arts and creative industries outside the cities, and high profile members of our creative community have declared it’s time to remove regional barriers so that creative industries can expand and thrive. 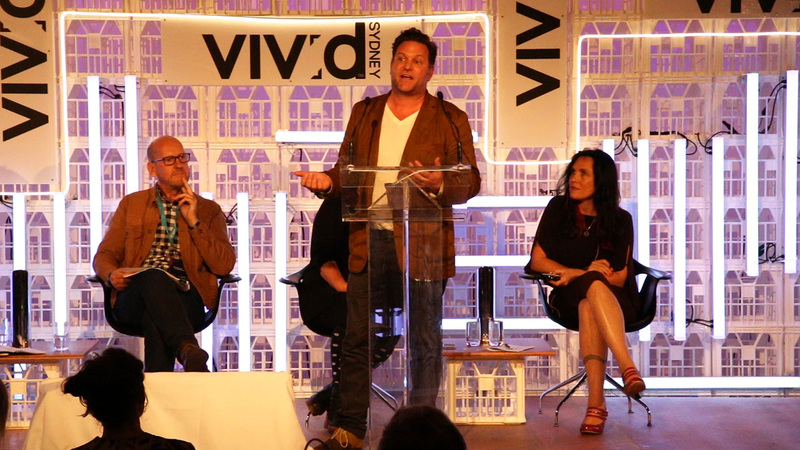 A panel of northern rivers creatives, including Byron Bay International Film Festival director Jaimee Skippon-Volke and head of Arts Northern Rivers Peter Wood, spoke on a panel last week at Australia’s largest festival, Vivid Sydney. Skippon-Volke says faster and more reliable broadband access in the region is a major hurdle for growth in creative industries. ‘There were days in the lead-up to the film festival when we were at 15 per cent of our productivity – upload speeds are killing us,’ she says. Skippon-Volke says that while some businesses are finding inventive ways to get around the slow broadband, many are losing significant productivity because of limited upload speeds. In another issue, a clear desire has been articulated by creative industries in the region to have more opportunities for collaboration and Skippon-Volke says television and film projects could facilitate this. Arts Northern Rivers’ Peter Wood says another factor holding the issue back is funding. While the region punches above its weight in terms of arts funding, the high concentration of artistic and creative people here means there is tough competition. Wood is calling for Byron Shire to be recognised nationally for its exceptionally high concentration of creative talent. ‘If we are recognised as a creative industries hotspot it will bring more strategic support to the area. We need more grants,’ he says. Wood says it is positive that the region’s local councils understand the benefits for creative industries both to wellbeing and as an economic driver. ‘This doesn’t necessarily translate into funding, but half the battle is done because the councils understand it,’ he says. Regional Development Australia supported the northern rivers’ presence at Vivid Sydney, and CEO Kimmaree Thompson says it is important to let the rest of the country know about the concentration of creative industries talent in the region. ‘By showcasing the work of our creative professionals to the people in Sydney, our region can attract more national and international clients for our local businesses,’ Thompson says. ‘We are working on a number of projects that will link creative businesses in our region with sources of work from corporates and startups across Australia,’ she says. ‘To be a sustainable creative industries hub, we have to build businesses so that they employ local people,’ she says. Winners are grinners (l-r): Rob Crossley, from the New Brighton Village Association, Byron shire councillors Di Woods and Basil Cameron, Kathy Norley (president of the South Golden Beach Community Association) and mayor Simon Richardson are all smiles as the manager of the Shores United Football club, Kim Fearnside, and its president, Marc Patten, jump for joy this morning (Wednesday) at the sports fields site at Shara Boulevard. Photo Jeff Dawson. The long saga to find a suitable site for sports fields in the north of Byron Shire has come to and end with today’s announcement of by Byron Shire Council that it had bought a parcel of land at Shara Boulevard in Ocean Shores. The seven-hectare block, on the corner of Shara Boulevard and Brunswick Valley Way, was bought by Council for $318,000 (excluding GST) and council says has potential for two playing fields, an amenities block, car parking, community play spaces and park furniture. The purchase is considered a bargain given the land’s asking price when it first went on the market was almost $2 million. 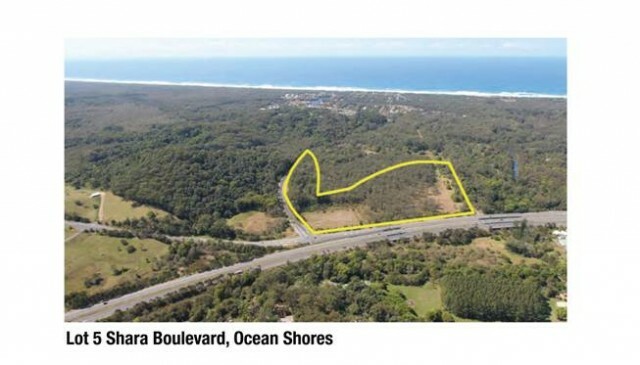 Ironically, Lot 5 Shara Boulevard, was sold by the widow of the late Queensland-based developer Chum Vidgen, who died in 2012 aged 73 and was often at odds during the 1990s with council and environmentalists over his developments . The site had a longtime approval for a service station and another smaller site of 1.7 hectares just across the road, also owned by the Vigdens and up for sale, has approval for a motel and restaurant. Mr Vidgen developed the Ocean Shores Shopping Village as well as many housing projects in the shire. Eight years ago he sold land he owned at Yelgun to the consortium behind the Splendour in the Grass festival-site development. 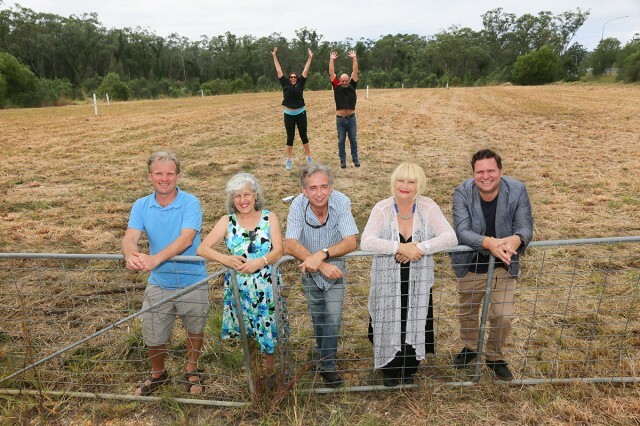 Mayor Simon Richardson said the newly-acquired site was in early 2013 considered as part of a review of potential playing field sites for the north of the Shire. ‘With an initial asking price on the land at $1.95 million, it was out of our reach. But as the market changed, the block has come within Council’s budget and it’s a significant financial purchase for our residents,’ Cr Richardson said. Council is currently waiting on land rezoning confirmation from the state government as part of the Local Environment Plan (LEP) process and plans to consult with community groups over the next few weeks to lock-in design ideas. A council spokesperson said that following the design completion, Council will lodge a development application and aim to start construction within a year on the first field, car parking, amenities block and lighting. The spokesperson said Council had around $2 million in available funding from Section 94 developer contributions for the Ocean Shores/South Golden Beach sports fields programs. The site already has sewer and water connections, road infrastructure and much fill material available to help with initial levelling works, which the spokesperson said amounted to savings in significant construction costs. Cr Richardson said that as the the site was a corner block and had two street frontages, it also offered ‘great access for transport along with the added advantage of cycleways right to the entrance’. 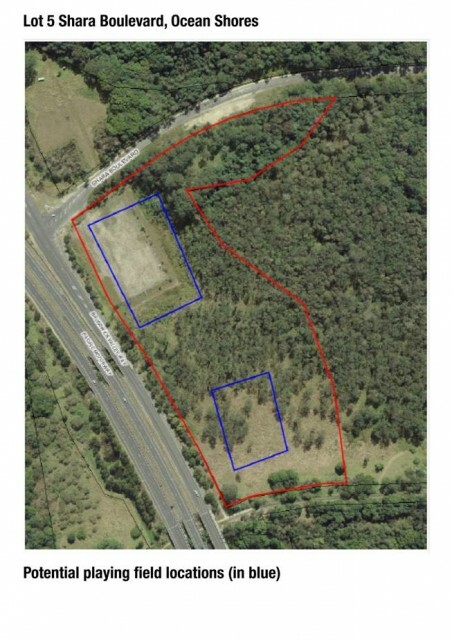 The Shara Boulevard site has direct access to Brunswick Valley Way (the main access feeder road) which is linked to the nearby Yelgun interchange on/off ramps of the Pacific Highway as well as Billinudgel, Ocean Shores and Brunswick Heads. The council spokesperson said that as a result of the land purchase, Council would no longer pursue other potential sites for sport fields at Billinudgel. ‘Council is committed to sports field in the north of Byron Shire and today was a very exciting announcement,’ Cr Richardson said. ‘We will continue to talk to sporting and community groups and find ways to deliver health and social outcomes for our residents. ‘Today’s announcement is testament to the commitment of the last group of councillors, a testament to the risk taking can do altitude of the current council and staff, and a testament to the passion and advocacy of the community of Ocean Shores and surrounds,’ he said. The history in the campaign to establish sports fields in the north of the shire is checkered, with a nearby block of land known as Lot 107 Shara Boulevard the subject of much political argy bargy over the years before it was finally scotched. The then Greens-majority Council staunchly opposed moves to rezone the bushland there which some saw as a natural buffer for the highly populated areas surrounding it. Other sites at Billinudgel were also considered but their flood-prone nature and other impediments appeared to rule them out.